After our big breakfast at Republique and spending the afternoon on the beach, we needed to eat dinner before the concert. 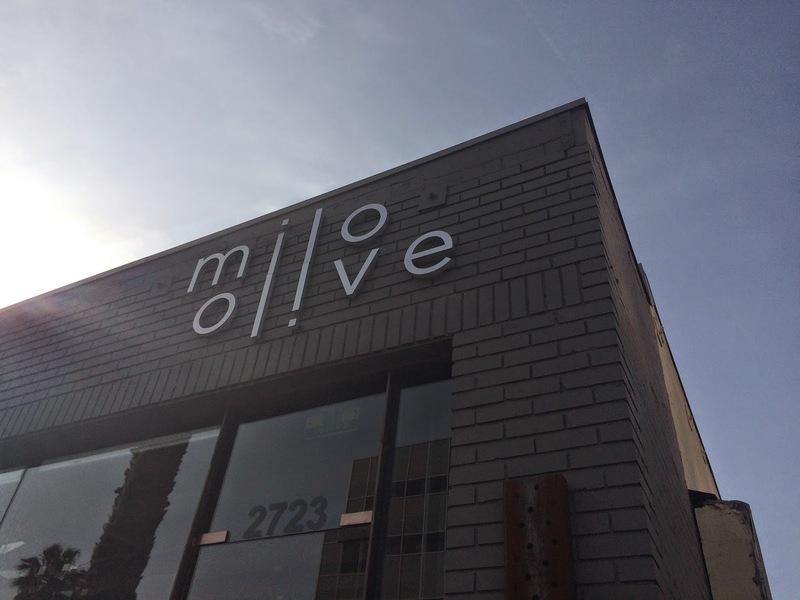 I planned Milo & Olive, owned by another chef duo couple, Josh Loeb and Zoe Nathan. 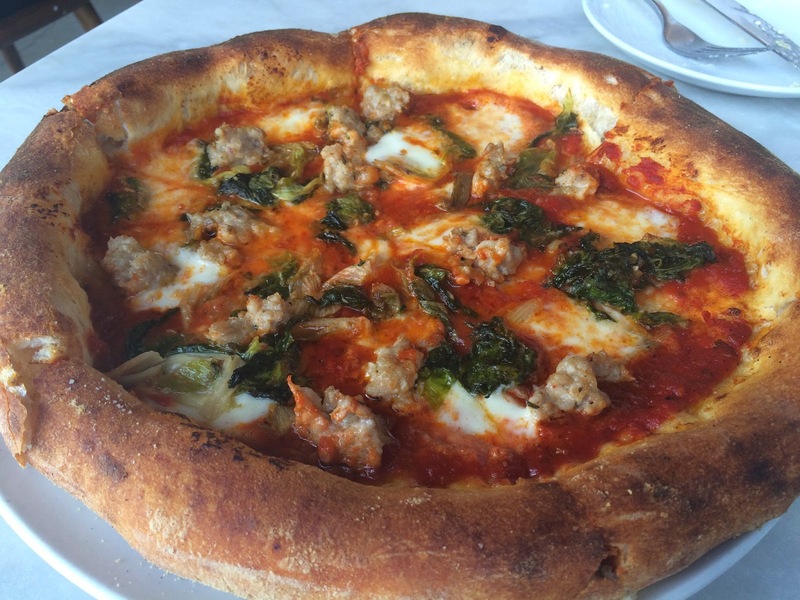 Josh and Zoe have created a small empire based in Santa Monica, CA, known as the Rustic Canyon Family of Restaurants. Their empire includes: a restaurant, Rustic Canyon; a bakery and pizzeria, Milo & Olive; a bakery cafe, Huckleberry; and a few ice cream shops, Sweet Rose Creameries. Over the summer Adam and I had visited one of their bakery cafes, Huckleberry. It was amazing, so I knew Milo & Olive would be no less. Milo & Olive is a neighborhood bakery and pizzeria open for breakfast, lunch and dinner, and has Italian food and pastries – two of my favorite things. Since we had a lot of pastries for breakfast we opted for a simple dinner and just one dessert. Milo & Olive is a small restaurant with limited seating. The little bakery is located right by the front door and served several different pastries including some vegan and gluten free options. It is an open kitchen with a beautiful wood fire oven behind the line cooks. There is bar seating where guests can watch the cooks prepare their entrees. Like I stated before, this is a small restaurant, and in effort to maximize as much space as possible the seating was a little too close for my comfort. Too close that it made Jody and I uncomfortable to the point of having to “think skinny” just to make it to our seats. Then we were so close to the guests next to us that we got dragged into their conversation. I can’t go on talking about how amazing the food is without sadly mentioning how terrible the service was. I will keep it short, but I will say that the service really left a bad taste in our mouth. The hostess said we could sit at the bar, only to stop us and realize there were no seats. Then, she took us to the dining room and made us wait for her to prepare the table for us. Lastly, our server seemed like she wanted to be anywhere else but there, and was not the slightest bit helpful in our selection process. Luckily the food left a good enough taste to make us want to come back again. Everything here from bagels, breads, dough, pasta, and anything in between is made in house with the freshest, local ingredients. The marinara sauce for their pizzas is so amazing that it is offered as a side entree. The pizza crust was so delicious I ate it all, even though I am sure I did not need any more carbs for the day! 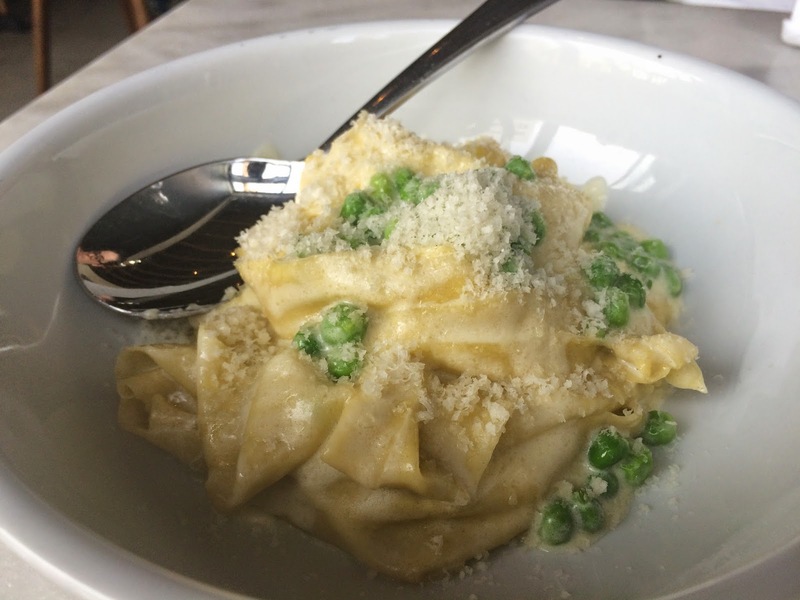 The pappardelle pasta was exquisite – al dente! This was a very simple pasta entree that was executed to perfection. Light and creamy lemon sauce, fresh English peas that added a nice crunch, and parmesan cheese to top it all off. This was a vanilla butter pound cake with melted butter on top. Their butter was from a local organic farm and was divine – I believe it was the key to what made this dessert great. The vanilla pound cake was warm from being baked in their wood fire oven which also gave the cake a nice crisp, golden brown outside. The middle and inside of the cake was luscious from the butter. The first bite was crunchy, followed by a smooth buttery finish. 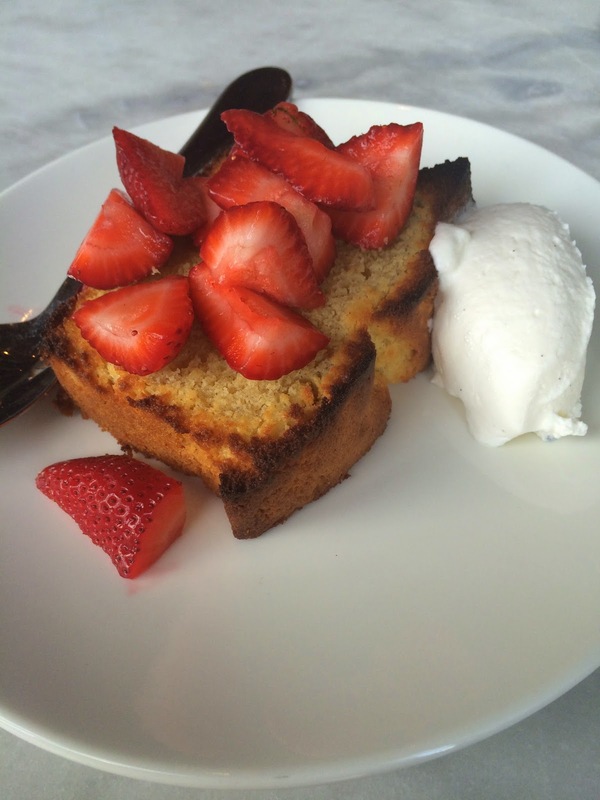 The creme fraiche whipped cream gave the buttery pound cake additional creaminess and the fresh strawberries added excellent sweetness to complete the dessert. This dessert is rustic and simple, but had a sweet elegance to it.